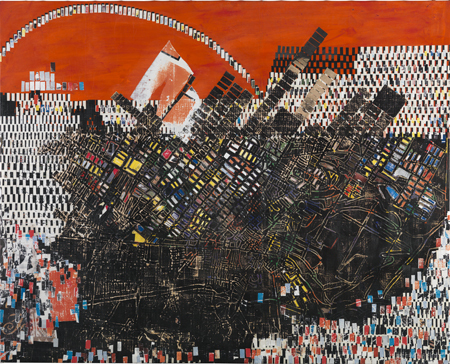 This piece, created by Bradford in 2006 is a commentary on the 1921 race riot in Tulsa, Oklahoma, a city that contained a neighborhood of affluent African-Americans that was nick named the Black Wall Street. The race riot, stemming from alleged rumors of an assault, virtually decimated the Greenwood neighborhood, leaving hundreds dead and thousands homeless. The results of the riot were virtually erased from state and local history. It wasn’t until 1996-1997 when the state legislature commissioned a report to properly record the incident. In 2001 report was used to properly record the race riot in the state’s history, and in 2010 a park was created in the memory of the victims of the Greenwood massacre. A documentary was created about this little known dark moment in our history (“Before They Die”).